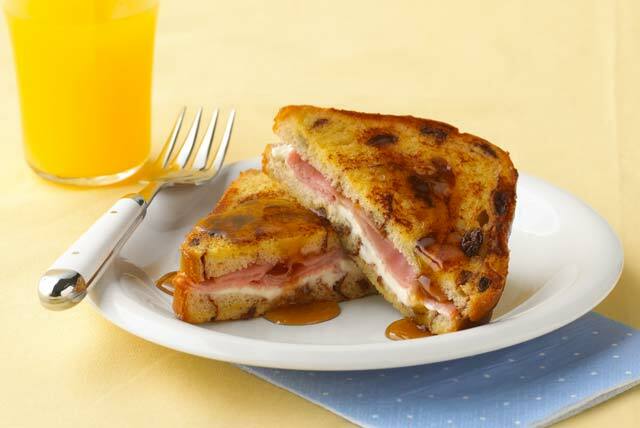 Enjoy this scrumptious French toast treat any day of the week. 1. SPREAD cream cheese spread onto 2 of the bread slices. 2. TOP with ham; cover with remaining 2 bread slices. Lightly press edges of each sandwich together to seal. 3. BEAT eggs, milk and sugar with fork in pie plate or square baking dish until well blended. 4. DIP sandwiches in egg mixture, turning over to evenly moisten both sides. 5. SPRAY large nostick skillet with cooking spray; heat on medium heat (adult assisted). Add sandwiches; cook 2 min. on each side or until golden brown on both sides. Serve with syrup. Makes 2 servings, one sandwich each.